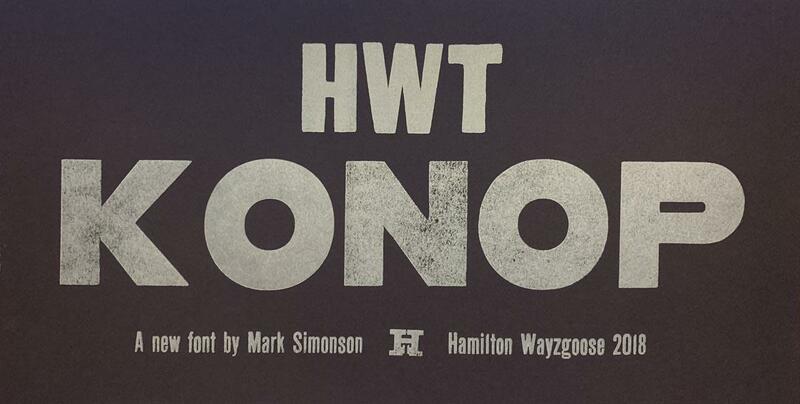 When I was asked in 2014 by Bill Moran, artistic director of the Hamilton Wood Type & Printing Museum, to come up with an original wood type design for The Hamilton Wood Type Legacy Project, I wanted to do something that would take advantage of the unique properties of wood type, but also something that hadn’t been done before. One thing I’d never seen was a monospaced or fixed-width wood typeface, and I thought this could be an interesting idea. But then I thought, what if the characters were not only the same width, but square? That way, the characters could be arranged vertically or horizontally and in any orientation. 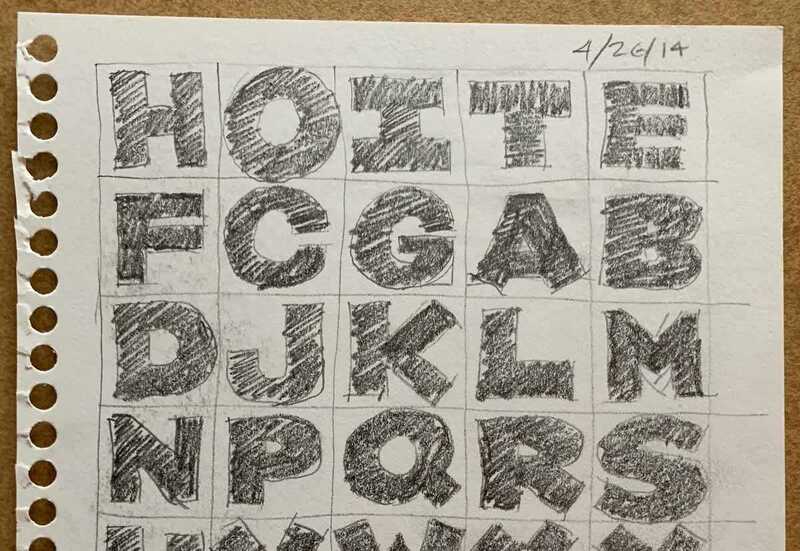 To a traditional letterpress job printer, a font like this wouldn’t make much sense. 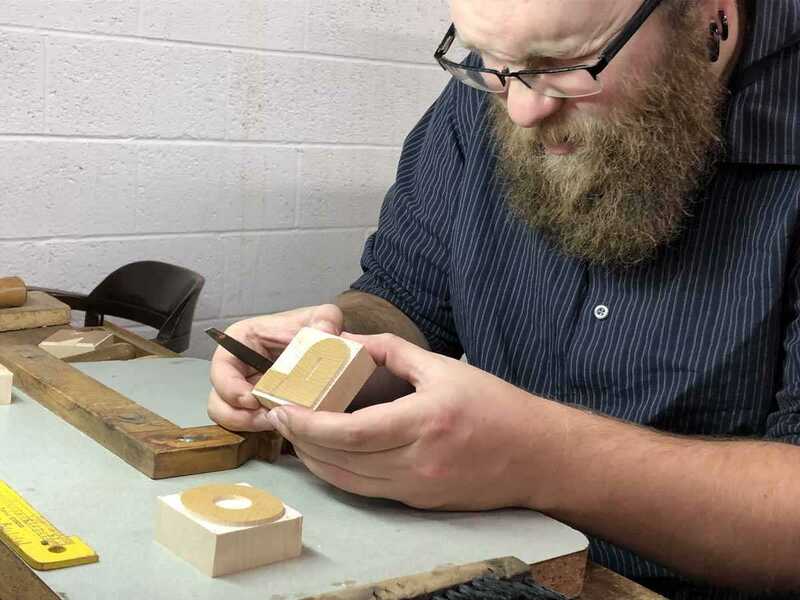 But to a modern letterpress printer, who tends to be more interested in self-expression and artistic effects, it could be an unusual and creative design element. The result is HWT Konop. For the letterforms themselves, I decided to use a bold gothic style, reminiscent of gothic wood types but more geometric. Since the characters are meant to be used in any orientation, I set aside some of the usual optical adjustments, such as making verticals thicker than horizontals and making tops smaller than bottoms. This, combined with the distortions needed to get all the characters to fit into squares, results in a quirky but (I hope) charming design. To provide more design options, I came up with a modular system consisting of three sizes: 12-line, 8-line, and 6-line. These three sizes can be used together like Lego® bricks, with endless arrangements possible. The sidebearings match so that characters always align when the three sizes are used together. 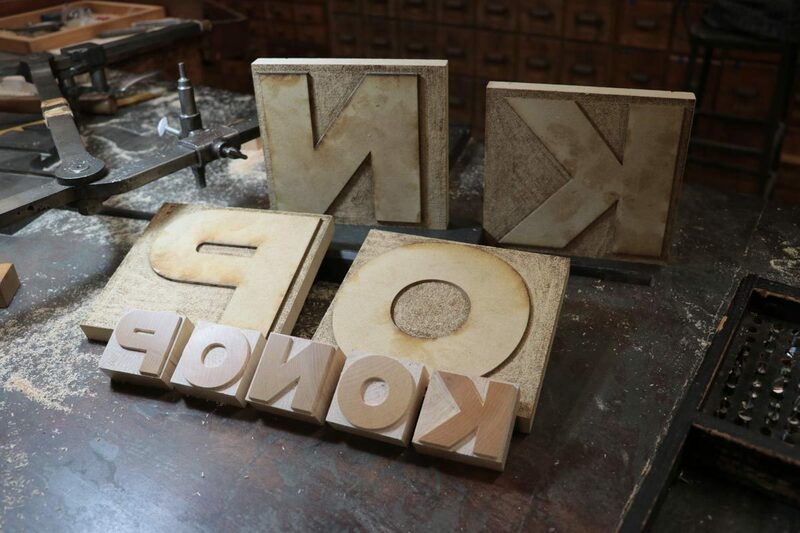 The digital version of Konop replicates the wood type version as much as possible, including the three different size designs. 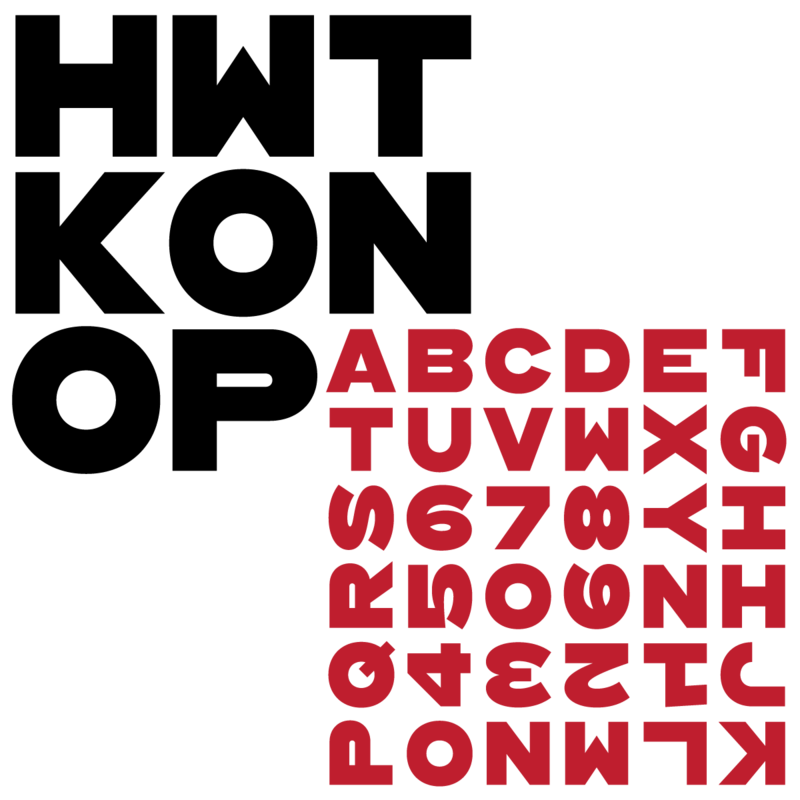 It includes OpenType stylistic sets that allow most characters to be rotated in place, 90° left, 90° right, or 180°, just like the wood type version. I also includes extra characters not available in the wood type version. Even so, since Konop was designed primarily with wood type in mind, it’s actually simpler and more fun to work with the wood type version than the digital version, if you don’t mind getting your hands dirty. 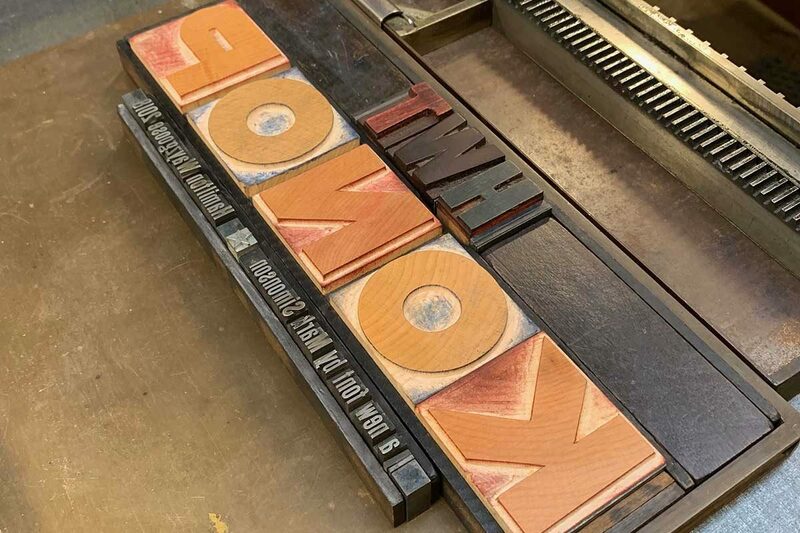 Production on the wood type version is just getting under way. Sample characters were cut last weekend at the Hamilton Wayzgoose by Georgie Brylski Liesch on the pantographic cutter (above) with hand trimming by David Carpenter (below). The photo below shows the finished 12-line pieces they cut, with the patterns behind them. 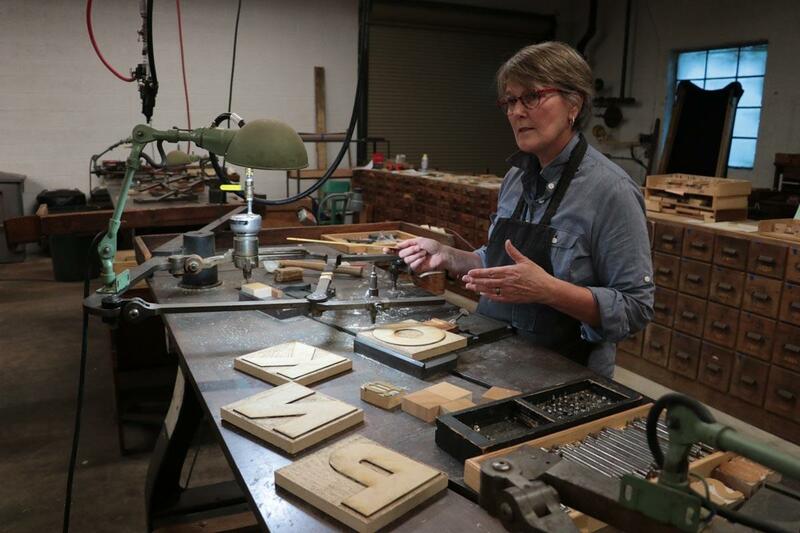 The patterns are traced with a guide on the pantograph and a high-speed router cuts the type. The size depends on how the pantograph is set up, but it’s always smaller than the pattern to get the best accuracy. Inside corners and small details are cut by hand. I’m not sure how soon the wood type version will be available for purchase, but you can get the digital version now from P22. You can read more about HWT Konop here.